The average life expectancy of a male in Mozambique is almost 56 and that of a female is 59.5. The country often gets hit by a number of epidemics, especially water-borne diseases such as cholera, which kills thousands of people each year. However, the biggest killed of all the diseases continues to remain HIV/AIDS. Coronary Heart Disease: CHD, commonly known as atherosclerotic heart disease or CAD, is a disorder or disease of the blood vessels that supply blood to the heart. Due to certain lifestyle and dietary habits, fats, oils and other material may deposit in the inner walls of the arteries, leading to formation of plaque. These plaques start to narrow the arteries, thus reducing the flow of blood in them. As a result, heart is deprived of proper amount of blood and this may result in chest pain or heart attack. CHD kills more than 4,500 people in Mozambique each year. HIV/AIDS: HIV/AIDS kills more than 81,000 Mozambique nationals each year. It is the biggest killer in the country, with a majority of individuals getting killed because of an infection contracted due to compromised immune system. An individual gets HIV infection from another infected individual through exchange of body fluids. It later develops into AIDS, which is characterized by weight loss and flu-like symptoms such as fever, chills and night sweats. Influenza: Pneumonia and influenza are two other causes that lead to death of more than 23,500 people in Mozambique. Commonly known as flu, influenza can prove fatal if not treated in time, especially in the high risk group. It is characterized by fever, runny nose, pain in the muscles, congestion, soreness, irritation, headache, nausea and body ache. It is a very common condition that affects older adults, children and pregnant women. Stroke: This is a condition characterized by insufficient or no flow of blood to the brain. This cerebrovascular event is a kind of an emergency that required immediate treatment. A person suffering from stroke is experiences specific symptoms, such as problem in vision, numbness, muscle weakness, vertigo, fatigue, headache, balancing problems, reduced sensation and speech loss. Stroke kills more than 10,100 people in Zambia each year. 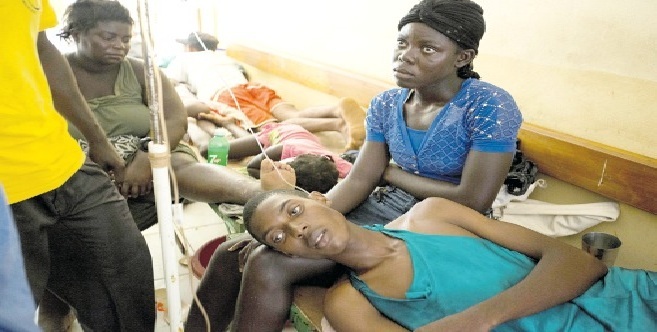 Meningitis: Meningitis kills almost 6,000 people in Mozambique in a year. It is characterized by inflammation of the membrane that surrounds the brain and the spinal cord, primarily because of a bacteria or viral infection. Meningitis may get cured by itself over a period of time or get worse, thus requiring immediate treatment. People suffering from meningitis may experience pain in the muscles, fever, chills, nausea, mental confusion, stiff neck, lethargy, shivering and sleeplessness. Cervical Cancer: This form of cancer kills more than 3,500 women each year in Mozambique. Cervical cancer forms when the cancer cells invade or begin to grow in the lowermost part of the womb called cervix. The cancer of the cervix is usually removed with the help of a surgery, chemotherapy and radiation therapy. A majority of women lose their ability to reproduce after surgery for cervical cancer. Kidney Disease: Diseases that affect the functioning of the kidneys kills more than 4,100 people in Mozambique each year. These diseases affects individuals by impacting the filtration capacity of the kidney or by blocking the filtration process or excretion of waste materials from the body. Nephritis, chronic kidney disease, kidney failure, renal cyst, cystic kidney disease, glomerulonephritis, pyelonephritis and amyloidosis are some of the common kidney diseases. Liver Disease: The conditions that damage the liver or prevent it from functioning properly kill almost 3,000 people in Mozambique each year. Hepatitis, fatty liver disease and cirrhosis are some of the common liver diseases that may prove fatal if not treated on time. Some of these diseases are caused by a viral attack, while others result because of an impact of alcohol and other toxic material on the liver. Epilepsy: It is a common seizure disorder that kills more than 2,700 people in Mozambique each year. It is a disorder related to the nerves in the brain, which is marked by an excessive and abnormal electrical activity in the nerve cells of the brain. Epilepsy results because of a traumatic brain injury or due to genetic reason. An individual suffering from an epileptic episode suffers from amnesia, seizures and rhythmic muscle spasm or contractions. Oesophagus Cancer: Esophagus Cancer cancer kills more than 1,000 people in Mozambique each year. It occurs when cancer cells appear in any part of the tube that runs down from the throat till the stomach. It is a rare form of cancer, which is treated with the help of surgery, chemotherapy and radiation therapy. It affects the normal eating habits of the individual and may lead to coughing, heartburn, weight loss, indigestion, chest pain and change in voice. Oral Cancer: Oral cancer kills more than 800 people in Mozambique each year and is characterized by development of cancer cells in any part of the oral cavity or mouth, including the tongue, gums, hard palate or soft palate. It is a common form of cancer that lead to formation of white or red lumps or patches inside the mouth. It is treated with the help of surgery and radiation therapy and by eliminating the risk factors such as HPV infection, smoking and alcohol use. Lymphomas: It is the cancer of the lymphatic system that kills more than 700 people in Mozambique each year. It is of two types – Hodgkin’s lymphoma and non-Hodgkin’s lymphoma. It is important to treat this cancer early with the help of medications, stem cell transplant, chemotherapy and radiation therapy because the disease-fighting ability of the body is hugely compromised in case of lymphoma. A person suffering from lymphoma may experience formation of a lump in the groin, neck or abdomen (key locations where lymph nodes are present), weight loss, shortness of breath and swollen lymph nodes.